At Santa Clarita Dental Care, we believe that successful orthodontics is patient-focused and based on leading-edge treatment in a warm and friendly environment. We look forward to helping you select the right orthodontic treatment to fit your lifestyle; we utilize the latest technological advances in orthodontic treatment, including the new self-ligating brackets, almost invisible ceramic braces and Invisalign®, along with the latest in computer technology (digital imaging and advanced computer graphics) to ensure that you receive the most effective care and beautiful smile possible. Our mission is to create the finest possible smile for you at any age. Invisalign® is a state-of-the-art alternative to braces that is virtually undetectable to other people. Invisalign straightens your teeth with a series of clear, customized removable appliances called “aligners” – no brackets or wire! Invisalign uses incredible three-dimensional computer imaging technology to create your aligners. Patients wear each aligner for about 2-3 weeks, removing it only for eating, brushing and flossing. As you replace each aligner with the next, your teeth will move gradually under Dr. Okuyama’s care. Some patients benefit from early treatment procedures based on the orthodontic condition they present with. Treatment of these problems at early ages can produce benefits that would be more limited if treated at a later time. Such treatment usually requires a two phase program. Santa Clarita Dental Care offers digital x-rays; a sensor is placed in the mouth while a computer generates an image in a few seconds. Not only is the process faster than traditional dental film, these images may be enhanced on the computer and enlarged. Digital x-rays are environmenatlly friendly and reduce radiation exposure to patient and staff by 90 percent. 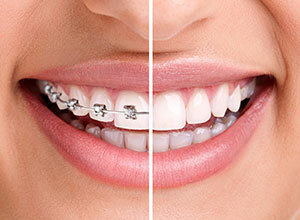 Santa Clarita Dental Care offers the latest in orthodontics. Call our office today to schedule a consultation and answer any questions you may have.